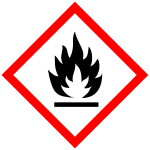 Any substance or mixture of substances which presents a hazard to health and safety is a Hazardous Substance and must be categorised and labelled in accordance with international requirements. 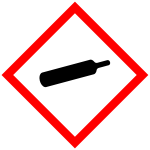 The term Dangerous Substance is usually used to define a group of Hazardous Substances that are hazardous because they are explosive, highly flammable or flammable (they may also be a risk to health). 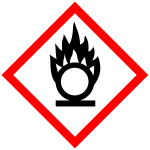 A dangerous Substance will normally be labelled with one of these symbols and carry some warning words. 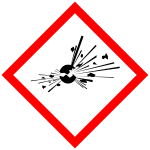 Dangerous substances include liquids such as solvents, paints, inks, petrol, dusts including wood dust, flour, sugar and other fine organic materials and compressed gasses including oxygen, acetylene and liquefied petroleum gases. Employees and members of the public are at risk of personal injury, including severe burns, from exposure to flammable and explosive chemical substances and agents. Business continuity is also at risk. Fire or explosion causes severe disruption; stored raw materials, finished product, plant and equipment or the building itself may be damaged or destroyed. Most businesses involved in severe fires do not fully recover from its consequences. The hazards and risks can be eliminated by substituting safe materials or reduced by appropriate control measures including properly designed appropriate storage, segregating the use of such materials, removing potential sources of ignition, fire detection and control measures and detailed training and supervision of the workforce.